But I'm not suggesting you don't go. Just go very prepared and know what you're getting into. The (pretty obvious) thing about hiking in Grand Canyon that's different from many other hikes is that you go DOWN before you go back up. And as you go down, things get hotter. Then you have to do the much harder work of getting back out, so, even in cooler weather, people get into pickles because down is so easy, and they end up going down farther than they really should. In the summer, though, those pickles get a LOT hotter and even more dangerous, with temperatures at the bottom of the Canyon often 20 to 25 degrees (Fahrenheit) higher than on the South Rim. That difference can stretch to 30 degrees or more compared to the North Rim, which is another thousand feet higher. And with all that added heat comes more things to think about and plan for before you start your hike. Having hiked in Grand Canyon many times myself, as a recreational trekker and on several Search & Rescue missions over the years, and working there as a guide, I wanted to share my suggestions for things to consider before going below the rim in summer, so you can make the most of hiking into that amazing natural wonder and get back out safely. Generally, figure on a 10-degree Fahrenheit difference for every 2,000 feet of elevation change. So, the temperature on the South Rim (7,200 feet above sea level) may be a dry 80 degrees with a breeze, but at the same time at Phantom Ranch (2,400 feet) it can be a blazing, breezeless 120 ... or more! Have you hiked below the rim? If yes, have you hiked in the summer? Yes, I've hiked below the rim but never in the summer months. Yes, I've hiked below the rim in the HEAT of summer. Nighttime can be a great time for hiking below the rim, especially during the summer. In the desert, we don't usually have much humidity floating around to hold in the heat of the day, so the difference between daytime and nighttime temperatures can often be 20, 30 degrees or more. I've experienced a number of 40-plus degree differences between the time the sun was overhead and when the moon appeared. So, if you're planning to hike into the Grand Canyon during the months of June through August, consider waiting till the sun is about to set before starting your descent and especially your climb. 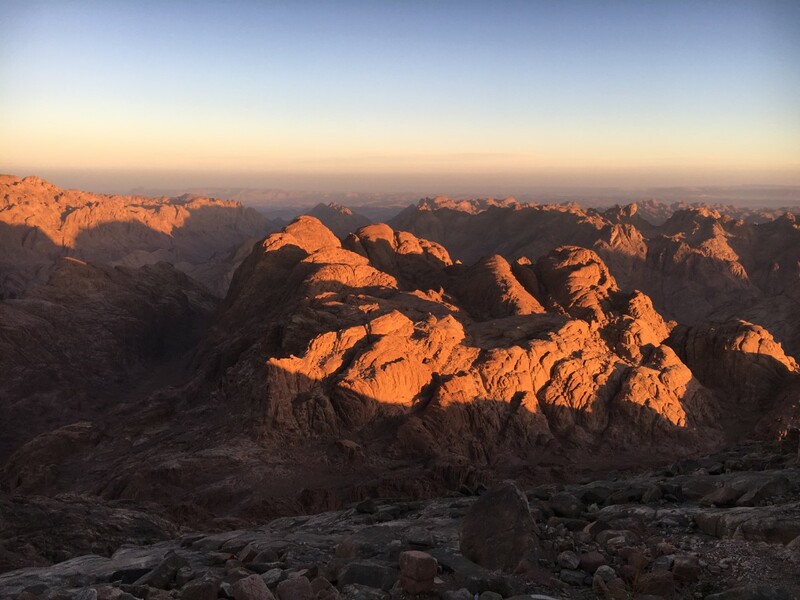 If night-hiking isn't your thing, try to hike early and hike late, before and after the sun is at its most intense. As a general rule, do your hiking before 10am and after 4pm. And that's a great thing! Sure, two trails may go from top to bottom, but no two trails are at all the same when it comes to the views, the footpath itself, or what I call the "personality" of the trail. 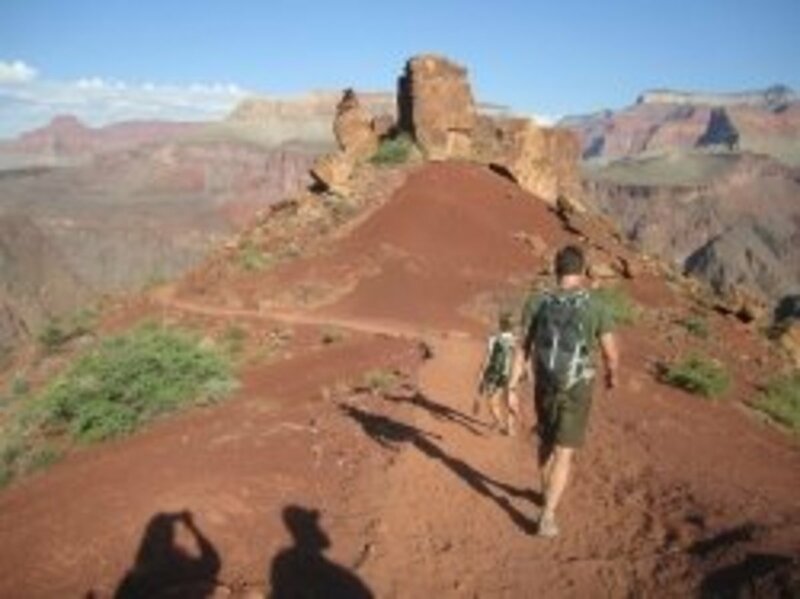 The trails in Grand Canyon are also different when it comes to the best times to hike in summer. That's partly because of the location of the sun versus the "exposure" of the trail -- South Rim trails have a northern exposure; North Rim trails a southern exposure; and trails on the Tonto Platform and Esplanade are basically out there in the open all the time. 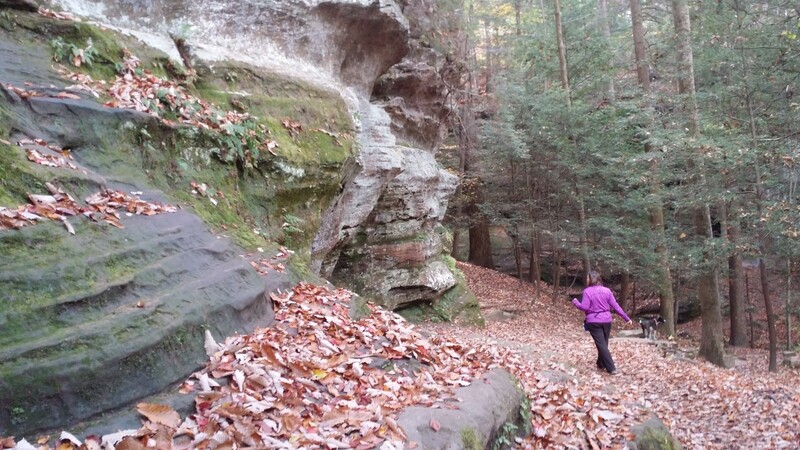 Another difference is that some trails are ridge trails while others tend to follow faults and side canyons. So the availability of shade is a big factor. 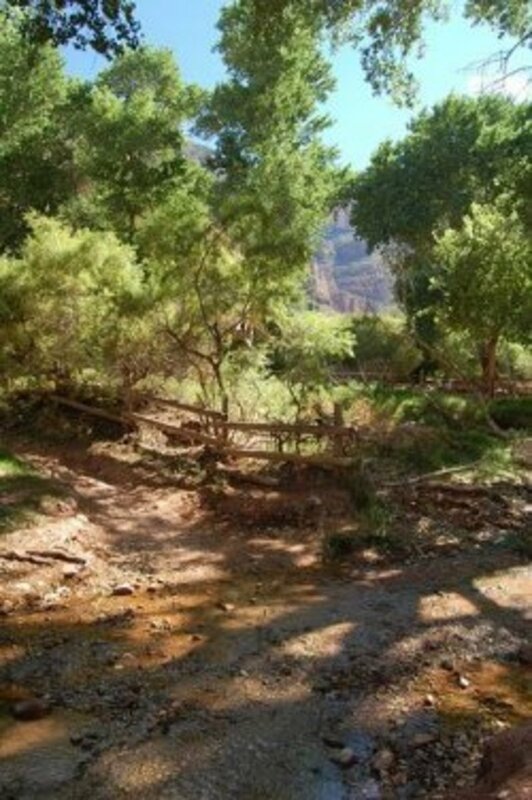 Facing the north, trails that descend the south side of the canyon are in the shade (or at least out of the direct sun) for longer on summer mornings than their counterparts on the north side of the canyon. Still, even if you start hiking at first light, it won't be long before things really start to heat up, especially on a trail like the South Kaibab, one of the two most popular "corridor" trails from rim to river. The South Kaibab Trail essentially has no shade, unless you count crawling into a crevice or under a rock. There's little vegetation large enough to rest under, and the trail follows a ridge which is fully exposed to the sun. And keep in mind there is NO WATER on the South Kaibab. The Bright Angel Trail, by contrast, follows a fault for much of its 9.3 miles to the bottom of the canyon, so there's much more shade along the way and for more hours of the day. Also, this most heavily used trail in the Park has more vegetation, two rest houses en route to the halfway point at the oasis known as Indian Garden, and another rest house between there and the river. 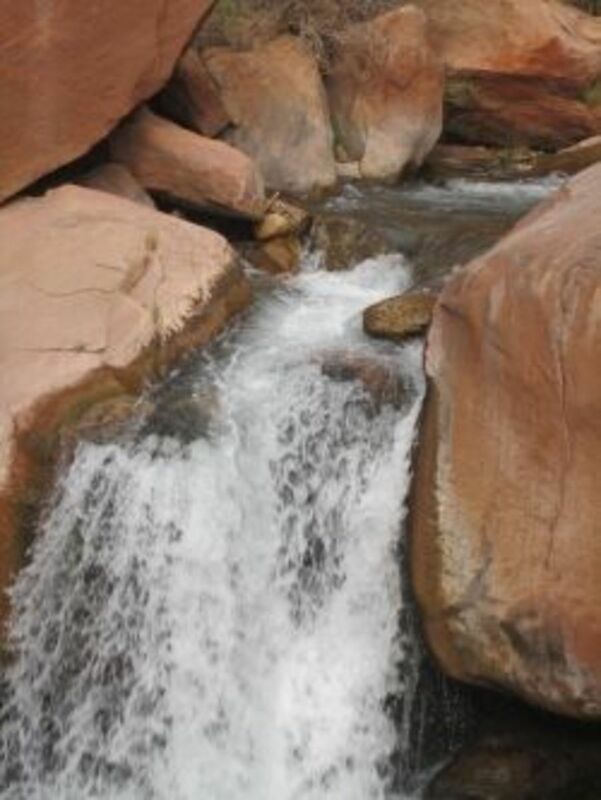 Another summer benefit to the Bright Angel is that there's potable water along the way, at the Mile-and-a-half and Three-mile rest houses and at Indian Garden, 4.6 miles from the rim and an equal distance from the Colorado River. Between there and the river, Garden Creek and Pipe Creek flow year-round but must be treated before drinking. There's also water available at another rest house, piped from the Colorado River. The Bright Angel trail is longer than the South Kaibab by a couple of miles, but unless you're hiking at night or very early in the morning for just a few hours, I'd recommend not using the S. Kaibab during the summer. At least, not for an ascent from river to rim. 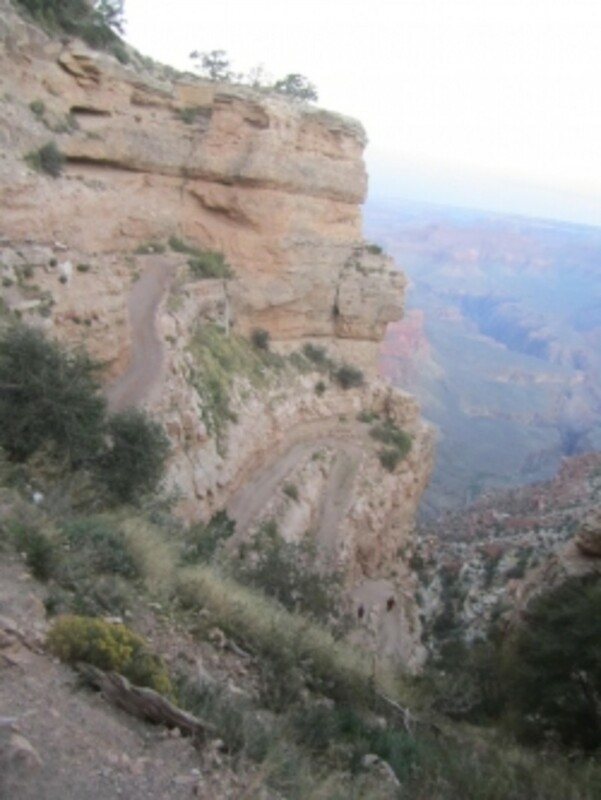 Climb the Bright Angel Trail instead. There are other South Rim Trails of course, including the Hermit Trail (There's water at Santa Maria Spring at 2.5 miles and Dripping Spring at 3.5 miles below the rim, but both should be treated); Grandview Trail (no water), Tanner Trail (no water), and South Bass Trail (remote trailhead, no water), but these are unmaintained, much more rugged and steeper trails. If you're new to hiking in Grand Canyon, I'd get some experience on the corridor trails before tackling the others ... at any time of year. Being more remote (a much longer drive from populated areas), the North Rim sees a lot less visitation than the South, as does its trails. The road to the North Rim is also closed for half the year, from mid-October to mid-May, due to the amount of snowfall. So, the North Rim really is a summer destination. 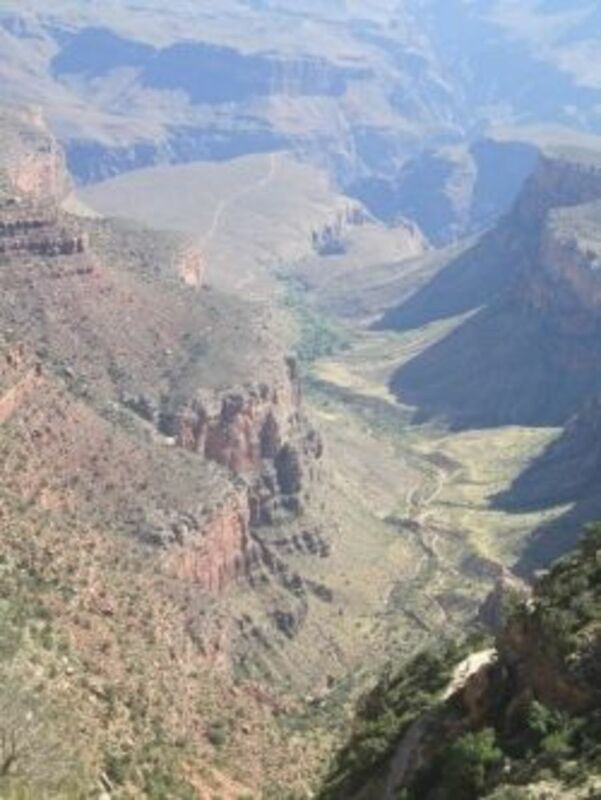 The most heavily used trail from the North Rim to the river is the 14-mile North Kaibab Trail, with an elevation gain (or loss) of 5,700 feet. So, you might begin a descent wearing a jacket, but you'll soon be feeling the heat. With a southern exposure, North Rim trails see the sun sooner than those on the south side of the canyon, but there are more trees on the upper reaches of the trails, and the North Kaibab follows the other side of the Bright Angel fault, so there's a decent amount of shade from the topography. Tunnel, and then the next water is at Roaring Spring, which is another 4 miles down canyon. There's also water at Cottonwood Camp, and then, if you have a filter or other way to purify, you can fill up from Bright Angel Creek, which follows alongside the trail (but is sometimes difficult to access). 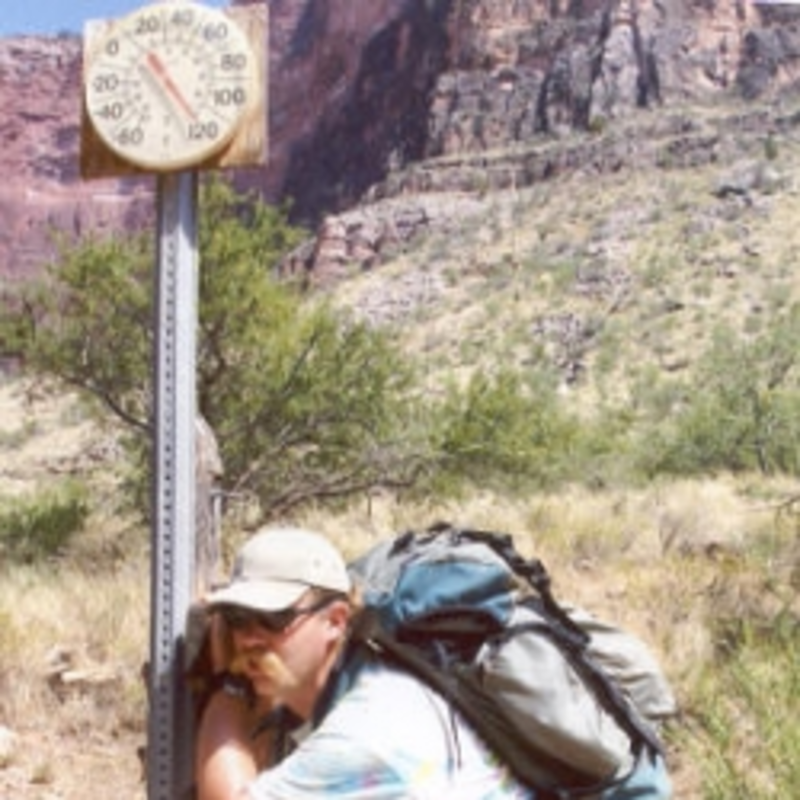 Hiking the entire N. Kaibab Trail in a day during the summer really isn't the best idea, because its length and level of difficulty -- particularly going up -- mean that you won't be able to avoid hiking during the hottest part of the day ... unless you start late and hike during the night. 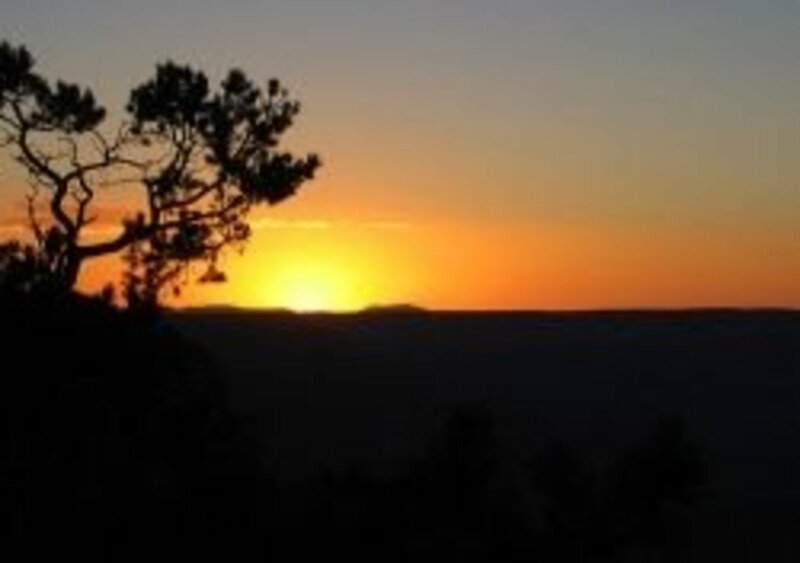 See Frommers.com for information on other North Rim Trails. PLEASE NOTE: It's advisable that you check with the backcountry office or a park ranger before you begin your hike, to find out if there's been any pipeline breaks, which can cause the potable water to be turned off. This does happen occasionally and can be a big problem for you if you're relying on those sources. It goes without saying that you need to drink a lot of water when you're hiking, especially in extreme heat. But if you've heard the standard "gallon of water per day per person," I'd double that in the summer in Grand Canyon, especially if a good portion of that day will be spent actually walking, in particular hiking back to the rim or on the very exposed Tonto Platform, for example. While pretty much everyone knows something of dehydration and what it means -- and that it can be deadly -- many aren't as aware, if at all, that too much water can also make you very ill and be equally as lethal. Drinking too much water without enough electrolytes to go along with it can lead to water intoxication and hyponatremia, which results from the dilution of sodium in the body. This is basically like drowning by drinking. In the process, it can cause irregular heartbeat, fluid in the lungs, fluttering eyelids, seizures, coma and ultimately death unless water intake is restricted and a hypertonic saline (salt) solution is administered. Yeah ... not good. So be sure to drink relatively small amounts of water frequently -- from 1/2 to 1 quart of fluids each hour that you are hiking -- and balance the fluid with food by snacking throughout the day, and alternate between plain water and some type of sports drink with electrolytes. The old standby: granola bars and things like Luna bars, Powerbars, etc. M&Ms (fairly good melt resistance), white chocolate chips, peanuts, almonds, shelled sunflower seeds, golden raisins, dried cranberries, banana chips, dried mango, prunes, and papaya. I sometimes add coconut if I'm making a batch for my husband too. I always keep some snacks in my pockets, so that I can munch while I walk, which encourages me to eat more, rather than always waiting for sit-down breaks. 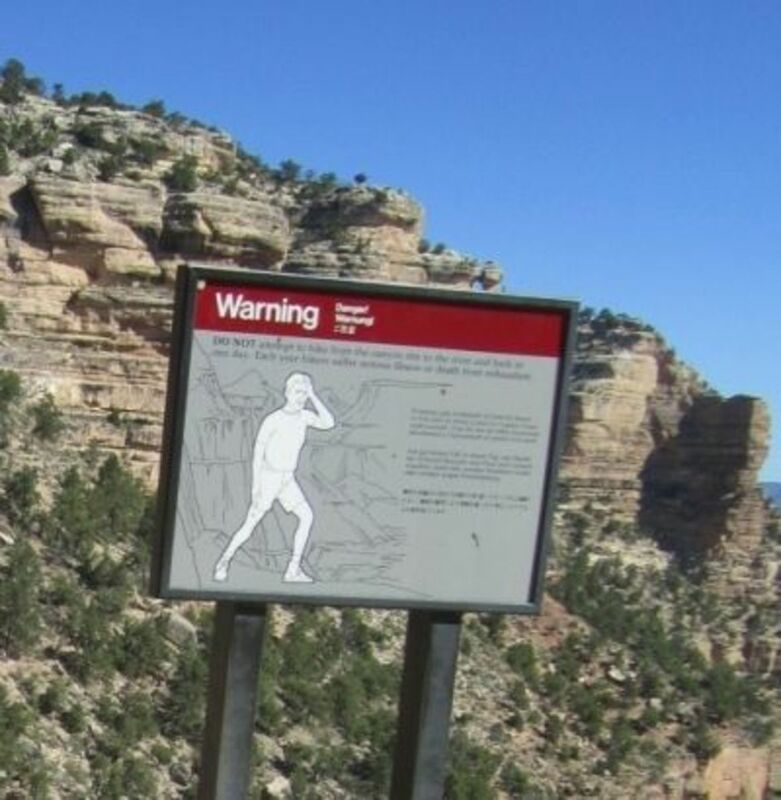 Signs like the one above were posted at trailheads following the 2004 death of a young, accomplished marathon runner who died of dehydration in Grand Canyon. These signs hopefully cause people to stop and think about what they're doing and how well prepared--or not--they are for venturing into the canyon ... perhaps long enough to save lives. Short sleeves or pants, that is. Which isn't to say I haven't done plenty of Grand Canyon hiking in t-shirts or sleeveless tops and shorts, but (now that I'm a little older and wiser) I tend to go with long, especially on top. You may have heard the common hiker idiom "cotton kills." And that can certainly be true, especially in the mountains and cooler, damper climates. That's because cotton doesn't dry very quickly when it gets wet -- from rain, snow, sweat, or walking through water sources -- and may not dry at all if you can't stop, take it off, and lay it out in the sun. So cotton can really speed up the hypothermic process, and hypothermia can be deadly. I always bring, if not start out wearing, a cotton shirt when I hike in Grand Canyon in summer. And that's for the very reason that cotton can otherwise kill. I can soak the shirt, put it on, and enjoy the cooling effect for a long time. A wet cotton bandana around your neck, or a drenched cotton cap or sunhat, is also a great way to cool down when hiking in the Canyon. Sure, you can wear full-on leather boots with steel shanks for hiking in Grand Canyon if that's what you're used to and prefer, but I think Gortex is just too hot. And big, clunky boots really aren't necessary. I recommend something lighter, especially in the summer, like breathable, mesh-lined ankle-high boots or trail runners. I wouldn't recommend hiking in sandals, though, even Tevas, in the Grand Canyon. You'll probably see people wearing them, but I just don't think they have the support you really need or the protection from jamming your toes into rocks, cactus, etc. If you do wear them, I'd at least wear socks. I can't stress what a big difference this makes. Take it from me, who usually doesn't wear hats. In the canyon, though, I always do in the heat. A ball cap works, but a wide-brimmed sun hat is even better. When I can, I drench the hat and put it back on. And don't forget your sunglasses and sunscreen. Just don't put the sunscreen on your forehead, where the sweat will drip it into your eyes. Ouch! Let the brim of your hat take care of that part. Really any wide-brimmed hat will do, but this one is particularly nice because it's got built-in UPF 50 sun protection, a wicking sweatband and mesh in the design. The hat, for men or women, is made of nylon. You want to wear a long-sleeve shirt that's MADE for hot-weather hiking, like this one from a popular maker of outdoor gear and clothing. This shirt has a collar that you can flip up for added sun protection, mesh side panels and at the center of the back for ventilation, and seams that are rotated away from pressure points so it's comfortable under a pack. This shirt, which is made of "desert cloth" with an antimicrobial finish, comes in a variety of colors, but I'd go with light for desert hiking. I rarely hike in anything but synthetic convertible pants that can be easily turned into shorts without taking them--or your shoes--off. I like that versatility. And a good pair is very comfortable (someone asked me if the zippers around your legs, above the knees, rub ... but, no, they don't) and they dry quickly. This particular pair has built-in UPF 50 sun protection in the fabric, which is a textured nylon. 100% Cotton socks just don't cut it for any type of hiking at any time of year, if you ask me. These all-weather synthetic socks are made of 50% Coolmax polyester, 22% stretch nylon, 21% X2O Acrylic, and 7% cotton. They have a mesh instep and a "Y" heel pocket. I really like these medium height boots with a mesh lining and rubber toe. This is a brand I've worn a lot, and I find their style comfortable, durable, and they hold up really well with tough use. If you want something even lighter, more like a rugged sneaker, check out these Vasque Aether Tech Trail Running Shoes, which I've also worn and loved. When I was guiding at the Canyon, one of the most frequent questions I got, from both kids and adults, was, "How many people here have died from rattlesnake bites?" The answer (as of right now, anyway) is, "None." But that doesn't mean people haven't been bitten, so keep an eye -- and ear -- out. During the summer, rattlers (and other snakes) are most active in the evening and at night. While they don't want to come after you, they will defend themselves if you step on them, walk too close, or mess with them. So, if you do see one, make as wide a berth as possible. And don't wander around camp barefoot. This is another reason why closed shoes or boots are a good idea, as well as long pants. GrandCanyonTreks.org has a good article with lots of great photos of rattlers. See: Snakes in the Grand Canyon?. Another critter to be aware and beware of is the scorpion, which is found mostly at the lower levels of the canyon, especially the inner canyon. In fact, the most venomous scorpion in the country -- the bark scorpion -- is a plentiful resident at Phantom Ranch and Bright Angel Campground. But no BIG worry, because the bark scorpion sting isn't lethal to humans. Still, it hurts like HECK, so that's another reason not to wander around barefoot or stick your hands into crevices and under rocks. If you're concerned about these buggers, ask a ranger, who'll be happy to tell you about them and probably find one for you to see. The rangers sometimes give an evening talk at Phantom Ranch about scorpions. Read more about them on the NPS website in Ancient Assassin: The Life of a Bark Scorpion. 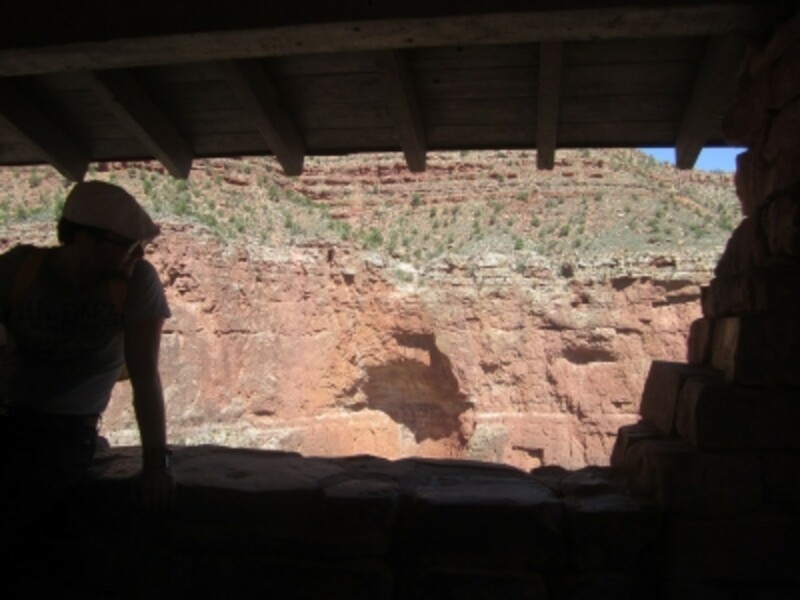 On one of my earliest hikes in Grand Canyon -- a rim to rim -- a ranger at Phantom Ranch made a suggestion that I took to heart ... and it really helped! She suggested that, on the climb out of the canyon, my hiking buddies and I stop at least once an hour, maybe even more frequently, and lay down and put our feet up for 15 minutes. So, I highly recommend this technique ... at any time of year. Do you have other tips for summer hiking in Grand Canyon? (Or hiking anywhere it's really hot?) Please share them with us in the guestbook below. Important notices and general information, with quick links to information on lodging, ranging programs, goods and services, food, visitor centers and more. Obtain backcountry permits for overnight camping, as well as permits for weddings, research, and other special events. Start here for more information on where you'd like to hike, as well as information on guided hikes, backcountry updates and closures, and more. Have You Done Any Summer Canyon or Desert Hiking? Share your comments and suggestions or ask a question. Truly excellent advice and suggestions! I have never hiked in the desert and sadly, I have yet to visit the Grand Canyon, but I definitely hope to soon. I try to avoid hiking in summer, although boy do I love the Grand Canyon! My dear, I have not done any such hiking ... but I will tell you ... YOU make me WANT to try it! Such a wonderfully presented page. 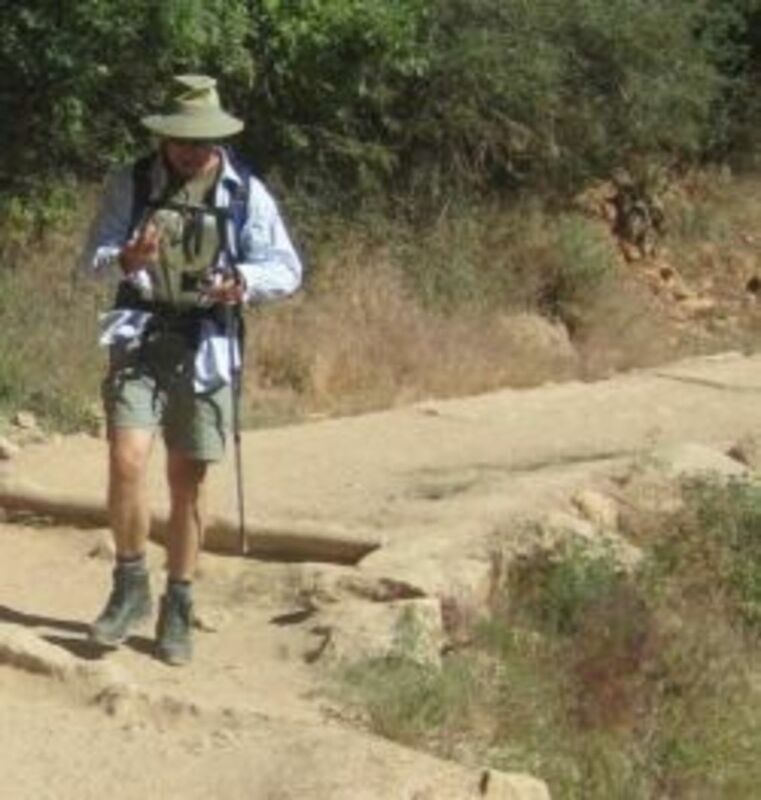 I have done a lot of hiking in the desert (and camping) when we used to live in Southern California. Now it is all green hiking trails for me in the Pacific Northwest. Very nice lens! I've just done some mountain hiking in Iceland. It was great though. This is a beautiful guide to Grand Canyon hiking... but as a "northern boy" there's no way I'd hiking anywhere near a desert, in the summer. I can barely handle Sedona (at 5000 feet) in the summer. My mom used to live in Mesa, AZ... and I generally voided visiting during the summer months. The desert in the winter and spring is lovely, though. Short hike in Palo Alto Canyon once - Texas. 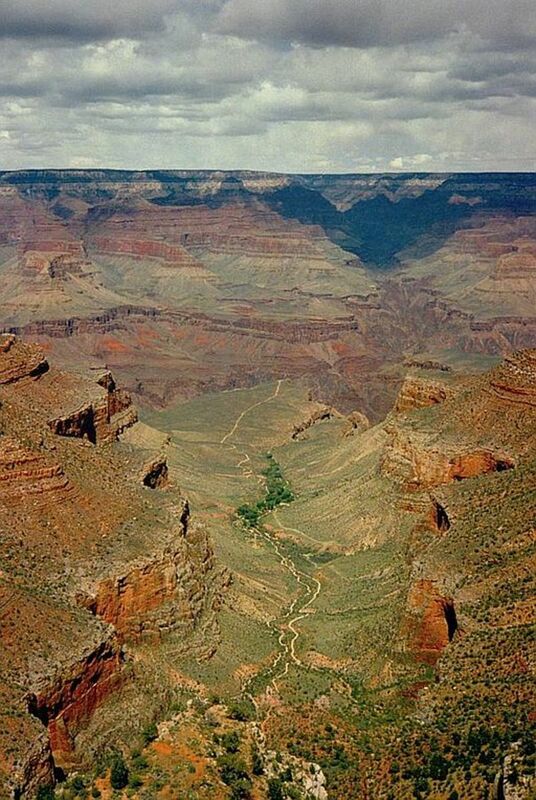 I visited the Grand Canyon as a teen and dreamed about hiking it. I never did, and now it looks like that was a good thing! I would have definitely done all the wrong things! Thanks for the awesome info. Now I'll be ready if and when I do get the chance! It is on my bucket list! I've been to the Grand Canyon twice now. The evenings can get very cool. Now I feel prepared for a long walk! I've done a small bit of desert hiking in Washington state, but not too much because it was always hot hot hot. Your article is positively beautiful. 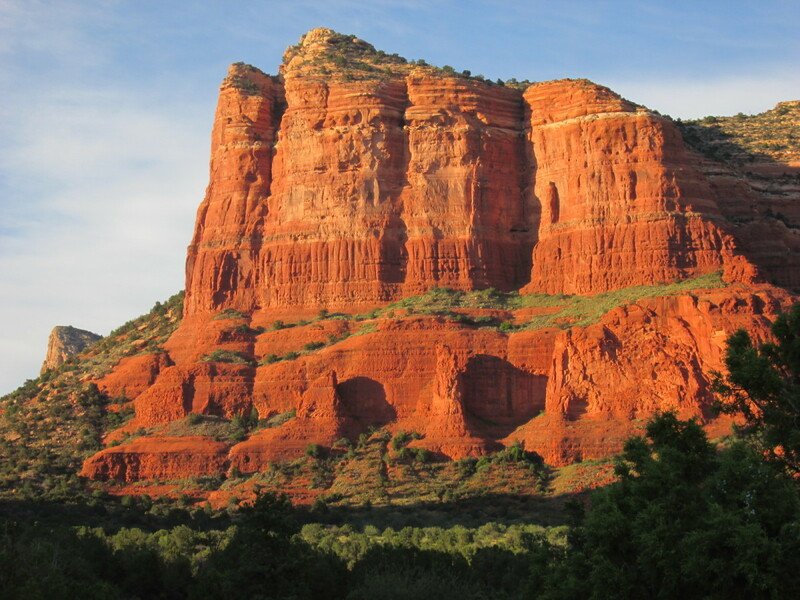 When I lived in Tucson I loved to go out hiking in the early morning or late in the day when it cooled down. Now I live about a half hour from the G. Canyon, but am too savvy to take any treks there, because of my age. But, the most beautiful sights I have ever seen are up there for sure. Very informative and useful article! No, but I would love to! Summer hiking there is vastly different to here where I live. Here it is wet, humid, slippery, full of leeches, but the waterfalls are pumping! I would love to do more of the hikes around the canyon and western USA in general. I have done winter and Spring hikes there but never summer. Some very sound advise and good information. I have visited the Grand Canyon several times. I have always wanted to do the hike to the bottom but time didn't permit it. Appreciate you sharing this lens for future visitors who might be planning a hike below the rim. Let's hope they take all safety precautions for a safe and fun adventure to the Canyon. Have a Great Summer! @Swisstoons: Hi, Swisstoons. There's no rock climbing necessary on any of the corridor trails or most of the other established trails in the canyon, but there is a varying degree of exposure -- meaning, fall hazard. When it comes to small children, I'd be very reluctant to take a child into the canyon in the summer, and I'd be very selective about which trails to use otherwise. I'd stick mostly to the Bright Angel and South Kaibab Trails on the South Rim and the North Kaibab Trail on the north, and then I wouldn't go down very far. Not with very young kids, especially those who aren't already hiking and/or who have a tendency to run around and not look where they're going. For most small kids, just a short walk below the rim--possibly holding a parent's hand--is plenty to experience the canyon. Really, it just depends on the child and how much experience he or she has already had on backcountry trails. I certainly would not take a child of, say, 6 years old all the way down to the bottom of the canyon, though I'm sure people have done it. Me, I'd go no more than to the One and a Half Mile Resthouse on the Bright Angel Trail or Ooh-Aah Point on the South Kaibab with a child of that age. 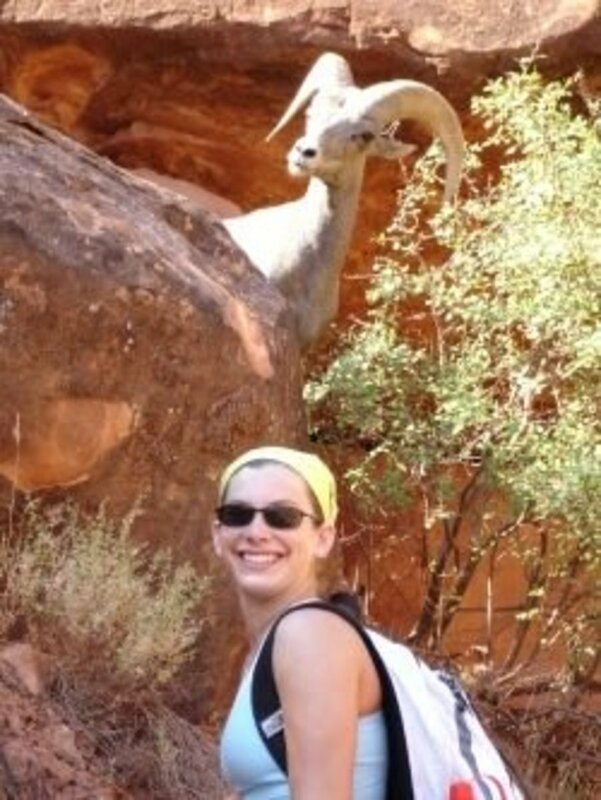 I like your photos, especially the one of your niece with the big horn sheep in the background. Nice! I have been to the area a couple of years ago and did a lot of hiking. Your warnings and suggestions are very good. Last year a couple form my hometown died in Joshua Tree, so I think especially people that are not familiar with the territory should take extra caution. I have been to the Grand Canyon, but didn't do any hiking there. It is such ah awesome sight to see. Excellent lens! Hiking the Grand Canyon sounds like a bucket list must-add. Couple of questions: Is the hike safe for all ages (say, 6 and up), provided ample water is consumed and suitable clothing is taken? Is there any "rock climbing," per se, involved...or is it all a matter of hiking trails? Your photographic journeys are always amazing. I love hiking through your eyes because my body is just not able to do it on its own. I think this would be a great place for geocaching!!! Great lens , and Grand Canyon is really hot in a summer. I really wish one day I will be able to go there. I've done some cycling out in Spain, where the sun is hot and entire towns are deserted in the summer months. We hit a problem when our planned restocking places were closes, along with the gas stations. We posted cash through an empty home's door and ate some of their garden tomatoes, otherwise we were in serious dehydration danger, before finding a standpipe outside an empty business which had been left open for just such emergencies. I've always over supplied significantly since then. Very informative and great details and pictures. I enjoy it so much! I live in Phoenix and hiking to my car in the summer is about all I'm up for. The Grand Canyon is beautiful but I wouldn't hike it in the summer! Great tips and love the photo of your niece and the mountain goat! It is a great view from the top of the canyon! I've been to Grand Canyon, but only in 1 day. Wish I could spend longer there so that I can hike below the rim. So much useful, easy to digest information here. Fabulous lens! Awesome lens! I wish I would have found this last fall when I lived in Valle, it would have really come in handy. I am back in the valley now (Mesa) and wish I would have hiked the Canyon more but I still have time to make some trips. While I was living off-grid in Valle though, I did hike Red Butte a few times, and if you haven't hiked it yet, I highly recommend it! It's only an hour north of Flagstaff and it is a Havasupai holy mountain with a great hike to the summit and inner-amphitheater where it blew out long ago. Just my two-cents...thanks for the tips! It's been years since we hiked there, very beautiful. This is fantastic info for any type of hiking. 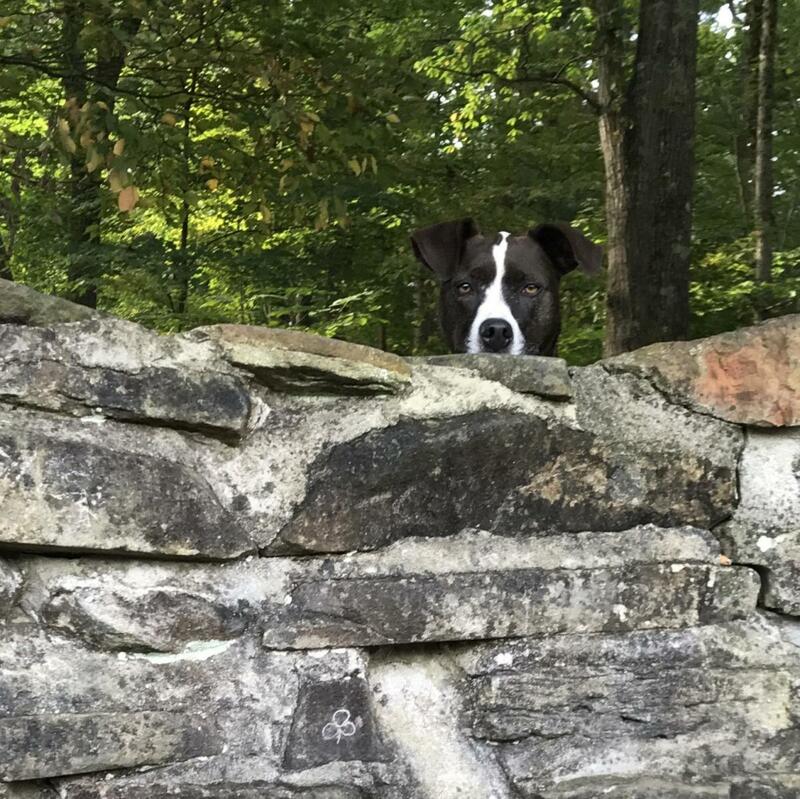 We've been on many dozens of hikes in dozens of parks. And everything that you posted here is triple true. In fact, following your suggestions can save a life. Great lens. Congratulations.